Cecil Wood posed with his three wheeled motor car, with tiller steering wheel, circa 1910. 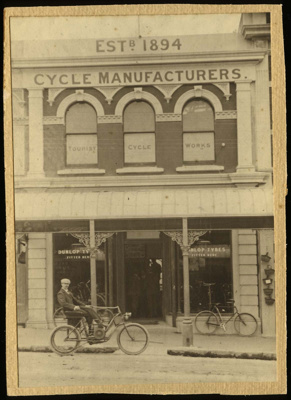 Pictured outside a two storied building with a sign reading, "Tourist Cycle Works" and "Estb. 1894 Cycle Manufacturers".